The popular cartoonist's fifth book depicts the humour in the NFC scandal, Scorpene, racism and corruption. PETALING JAYA: Having one book banned and a second investigated under the Sedition Act has done absolutely nothing to stop popular cartoonist Zunar from publishing yet another book on Malaysia. ’1 MOOLAYSIA’ is Zunar’s fifth book and like its predecessors, it too views Malaysia through a satirical lens. Zunar, whose real name is Zulkiflee Anwar Haque, said in a press statement that the book’s title was based on the National Feedlot Center (NFC) scandal. 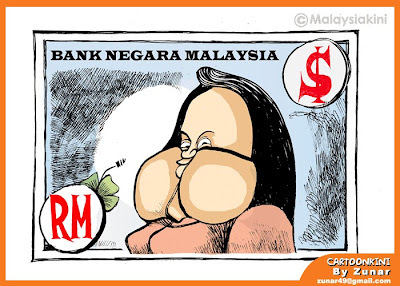 The book features a collection of his political cartoons that have appeared in (online news portal) Malaysiakini between July 2011 to March this year and in (international cartoon website) Cartoonmovement.com as well as a smattering of fresh pieces. “The cartoons mainly touch on issues that fail to be highlighted by local political cartoonists such as the prime minister (Najib Tun Razak) and his shop-a-holic wife (Rosmah Mansor), the conspiracy against (opposition leader) Anwar Ibrahim, Scorpene, racism, corruption and Malaysian politics in general,” Zunar said. He admittted however that continuous government pressure had made it difficult for him to find willingprinters and vendors to openly sell his book. “Some printers and vendors were told that they would lose their operating licences if they continuedprinting or selling my books,” he said. 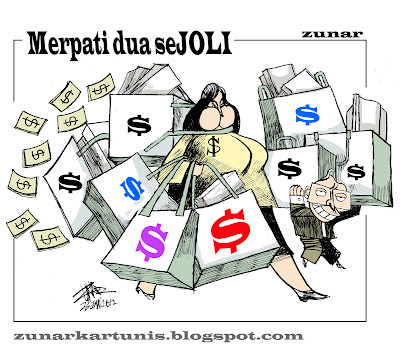 Zunar previous publications were “Even My Pen Has A Stand” (2011), “Cartoon-O-Phobia (2010), “1 Funny Malaysia” (2009) and “Cartoons on Tun…” (2005). His second book was banned on the grounds that its contents were “detrimental to public order” while the third was investigated under the Sedition Act. Zunar himself was detained under the same act just hours before the book’s launch on Sept 24, 2010. 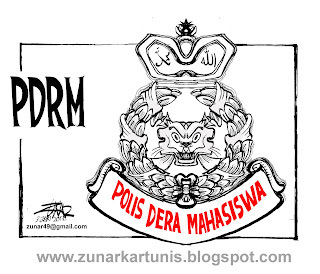 Last June the Kuala Lumpur High Courtrejected Zunar’s suit to challenge thegovernment on the banning of “1 Funny Malaysia’ and another book, “Perak Darul Kartun”. Zunar filed a subsequent suit to challenge the police and government on his detention immediately after publishing “Cartoon-O-Phobia”. The next session of the case will be on April 5 and 6. 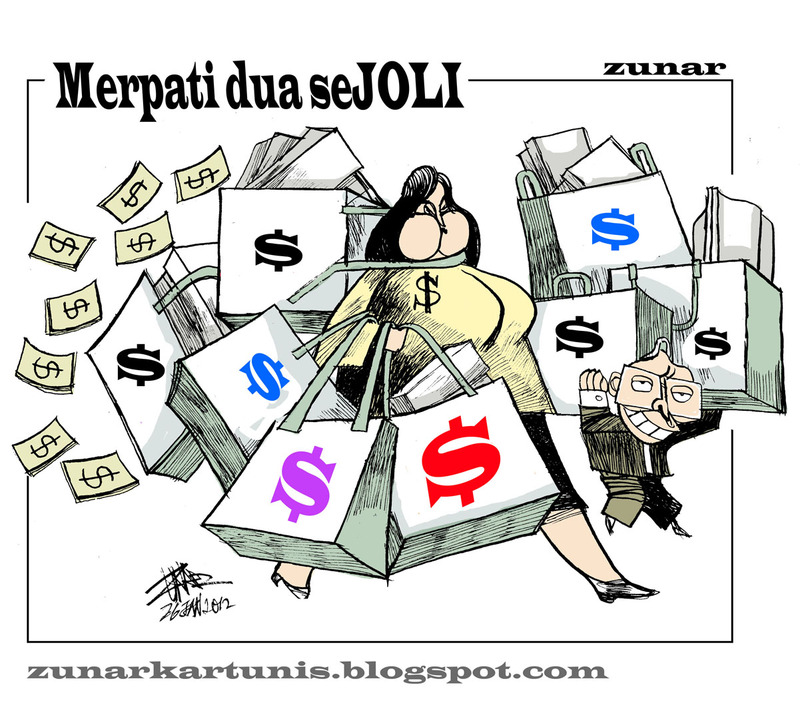 ’1 MOOLAYSIA’ retails at RM25 and can be purchased via http://zunarcartoonist.com. It will also be available for purchase at Amcorp Mall on March 24 and 25 from 10am to 5pm. Political satirist takes government to court over "Cartoon-O-Phobia"
Kuala Lumpur 18.01.12: Celebrated Malaysian political cartoonist Zunar (née Zulkifli Anwar Ulhaque) appeared at the Kuala Lumpur High Court today for the first hearing of a civil suit brought by himself against the government and the police, in which he challenges them for his wrongful arrest and detention in September 2010. The case looks set to revisit public discussion on sedition and free speech, and ARTICLE 19 welcomes this as a meaningful opportunity for the Malaysian government to review its controversial censorship laws. Represented by the group Lawyers for Liberty, Zunar is seeking the return of confiscated property as well as aggravated losses and damages incurred in the incident which took place on 24 September 2010. That night, hours before the launch of Zunar's latest compilation of political cartoons titled 'Cartoon-O-Phobia', the police raided the artist's office in Kuala Lumpur, seized all copies of the book and arrested him for sedition. "ARTICLE 19 fully supports Zunar in his efforts to seek damages from the Malaysian government. We recommend that the High Court sanction his wrongful arrest and detention and immediately lift the ban on all of his publications," said Dr Agnes Callamard, ARTICLE 19 Executive Director. "Ahead of anticipated elections in Malaysia later this year, Zunar' s case calls into question the government's commitment to bolster free speech," continued Dr Callamard. ARTICLE 19 is deeply concerned about the continued use of restrictive legislation to silence legitimate, creative forms of political expression in Malaysia. Zunar was initially arrested under the Sedition Act 1948, government officials later claimed that he had also violated the Printing Presses and Publications Act. Both offenses carry punishment of up to three years' imprisonment and/or fines. ARTICLE 19 finds the deliberate ambiguity surrounding Zunar's arrest and detention process problematic. Despite being moved to several police stations over the course of the night, the police neither offered a definitive explanation as to Zunar's offense, nor questioned him during his wrongful detention. After being held on a further day of remand, Zunar was then released without charge. 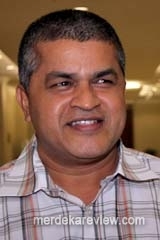 Under international law, arbitrary arrest and detention such as that experienced by Zunar is prohibited. In a career spanning two decades, Zunar has produced popular political cartoons which dare to lampoon public figures and institutions in Malaysia, with the aim of exposing the abuse of power by the police, judiciary, election commission and government officials. His work is considered sensitive, even radical, in Malaysia. ARTICLE 19 therefore urges the Malaysian government to hasten progress on a raft of reforms, including an immediate review of regressive media and censorship legislation such as the Sedition Act 1948 and the Printing Presses and Publication Act 1984, both of which exert a serious chilling effect on freedom of speech and of the media. Adalah diumumkan saya akan mengadakan pameran kartun-kartun politik di London pada bulan Februari depan bertemakan "To Fight Through Cartoon" (Berjuang Melalui Kartun) dan akan berlangsung selama sebulan di situ. Sebanyak 80 karya kartun yang menyentuh isu politik, rasuah, penyalahgunaan kuasa serta pelanggaran hak asasi di Malaysia akan dipamerkan. Antara isu yang difokus ialah Konspirasi terhadap Anwar Ibrahim, isu rasuah dalam skandal Scorpene, Isu pembunuhan Altantuya, Isu NFL, Isu isteri Perdana Menteri, BERSIH, Sarawak dan sebagainya. Ia dianjurkan oleh sebuah NGO antarabangsa, Artikel 19 yang memperjuangkan kebebasan bersuara serta informasi dan dibantu oleh rakyat Malaysia di United Kingdom yang bergabung di bawah Rakan Pakatan Rakyat. Majlis pelancaran akan diadakan di venue pameran tersebut iaitu di Free Word Centre, 60 Farringdon Road pada 15 Februari dan akan dirasmikan oleh pengasas Sarawak Report dan Radio Free Sarawak Clare Rewcastle Brown. Selain saya sendiri, turut berucap di majlis tersebut nanti ialah Presiden Persatuan Kebangsaan Hak Asasi Manusia (HAKAM), Malik Imtiaz Sarwar. Menurut surat jemputan oleh pihak penganjur, tiket untuk majlis tersebut adalah terhad dan ia berdasarkan siapa dulu dia dapat dan boleh ditempah dari sekarang hingga 3 Februari. Kepada orang ramai, terutama yang tinggal di United Kingdom boleh menempah tiket melalui link ini http://article19zunar.eventbrite.com/ atau email kepada sonya@article19.org. Tema "Berjuang Melalui Kartun" dipilih kerana kartun-kartun politik saya mendapat kekangan dan tekanan dari pemerintah Malaysia. Pada Julai 2010, kerajaan mengharamkan tujuh buku-buku kartun saya dengan alasan kandungannya menjejas ketenteraman awam. Selain tu, pejabat saya di Brickfeilds, Kuala Lumpur sering diserbu pihak berkuasa dan buku-buku saya selalu dirampas. Kilang pencetak diugut agar tidak mencetak buku saya atau kehilangan lesen dan kedai-kedai di seluruh negara juga diberi amaran agar tidak menjual buku-buku saya. Pada September 2010, saya ditangkap dan dimasukkan ke dalam lokap di bawah Akta Hasutan namun dibebaskan atas arahan mahkamah. Saya sekarang sedang menyaman kerajaan atas tangkapan tersebut yang pada pandangan saya salah dari segi undang-undang dan kes akan mula didengar pada 18 Januari depan di mahkamah Kuala Lumpur. To Fight Through Cartoon (Berjuang Melalui Kartun) adalah pameran solo saya pertama saya sepanjang 30 tahun berkarya. Sebelum ini pada akhir tahun lepas, saya juga mengadakan dua pameran bersama artis-artis yang lain di Bilbao, Sepanyol. 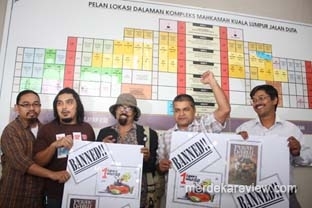 *Pada Julai tahun lepas, Rangkaian Hak Asasi Kartunis Antarabangsa (CRNI) memberi anugerah "Courage in Editorial Cartooning" (Keberanian Dalam Melukis Kartun Editorial) kepada Zunar. *Pada Oktober tahun lepas, Zunar dipilih menyertai program tiga bulan "Seni dan Penapisan" anjuran Yayasan BilbaoArte Sepanyol. *Zunar (gambar kiri) atau nama asalnya Zulkiflee Anwar Ulhaque ialah kartunis politik Malaysia. I would like to announce that I will be holding a month-long exhibition of political cartoons in London on next February with the theme “To Fight Through Cartoons”. I will be displaying 80 of my works that touch on issues such as politics, corruption, abuse of power and violations of human rights in Malaysia. The focus would on the conspiracy against Anwar Ibrahim, the corruption in the Scorpene Scandal, the murder of Altantuya, the National Feedlot Corporation (NFL), issues surrounding the Prime Minister’s wife, BERSIH, Sarawak, to mention a few. It will be organized by Article 19, an international NGO that fights for the freedom of expression and information, and is assisted by Malaysians in the United Kingdom who are affiliated under the Friends of Pakatan Rakyat. The launching will be held on the 15th February 2012 at the venue of the exhibition, the Free Word Centre, 60 Farringdon Road. It will be inaugurated by the founder of Radio Free Sarawak and Sarawak Report, Clare Rewcastle Brown. The President of the National Association of Human Rights (Hakam), Malik Imtiaz Sarwar will also be giving a speech in the event. According to the letter of invitation by the organizers, tickets for the event are limited and it is based on ‘first come, first served’. Tickets can be booked from now until the 3rd February 2012. The public, especially those living in the United Kingdom, can book the tickets through this link http://article19zunar.eventbrite.com/ or email sonya@article19.org. The theme "Fighting Through Cartoons" was selected based on the restraints and pressure from the Malaysian government that have been imposed on me and my political cartoons. In July 2010, the government banned seven of my cartoon books on the grounds that my books were detrimental to public order. Apart from that, my office in Brickfields, Kuala Lumpur was often invaded by the authorities and my books taken. The printers were threatened not to print my books or lose their printing license; as were bookshops across the country being warned not to sell my books. On the 24th September 2010, I was arrested and locked-up under the Sedition Act, but was then acquitted under the instruction of the court. I am suing the government for what was in my view an unlawful arrest. The hearing of the case will be on the 18th January 2012 at the Kuala Lumpur court. “To Fight Through Cartoons” will be my first solo exhibition throughout the 30 years I have cartooning. Prior to this, I have held two exhibitions with other artists in Bilbao, Spain at the end of last year. * In July 2011, the Cartoonists Rights Network International (CRNI), USA had conferred the "Courage in Editorial Cartooning" award to Zunar. 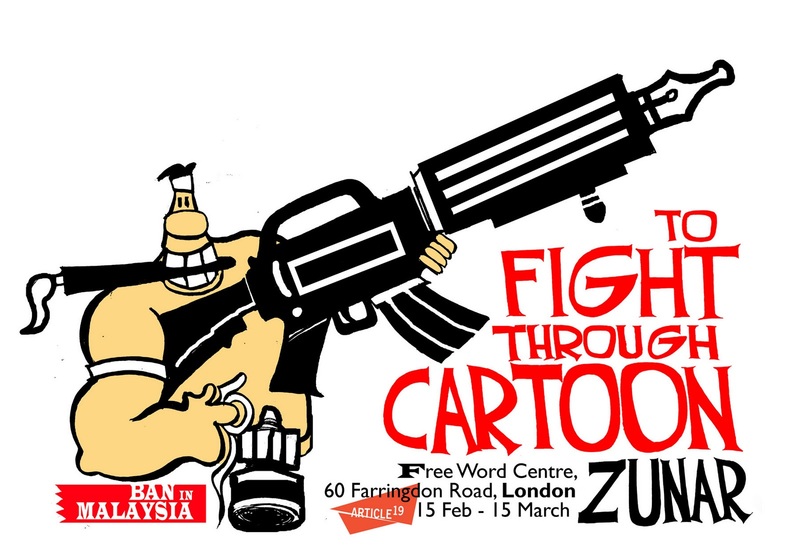 * In October 2011, Zunar had participated in a three-month "Art and Censorship" program organized by the BilbaoArte/Fundacion BBK in Bilbao, Spain. Sebanyak 80 karya-karya kartun yang menyentuh isu politik, rasuah, penyalahgunaan kuasa serta pelanggaran hak asasi di Malaysia akan dipamerkan. Antara isu yang difokus ialah Konspirasi terhadap Anwar Ibrahim, IsuRasuah dalam skandal Scorpene, Isu pembunuhan Altantuya, Isu NFL, Isu isteri Perdana Menteri, Bersih, Sarawak dan sebagainya. Ia dianjurkan oleh sebuah NGO antarabangsa, Artikel 19 yang memperjuangkan kebebasan bersuara serta informasi dan dibantu oleh rakyat Malaysia di United Kingdom yang bergabung di bawah Rakan Pakatan Rakyat. Menurut surat jemputan oleh pihak penganjur, tiket untuk majlis tersebut adalah terhad dan ia berdasarkan siapa dulu dia dapat dan boleh ditempah dari sekarang hingga 3 Februari. Kepada oarng ramai, terutama yang tinggaldi United Kingdom boleh menempah tiket melalui link ini http://article19zunar.eventbrite.com/ atau email kepada sonya@article19.org. Tema "Berjuang Melalui Kartun"dipilih kerana kartun-kartun politik saya mendapat kekangan dan tekanan dari pemerintah Malaysia. Pada Julai 2010, kerajaan mengharamkan tujuh buku-buku kartun saya dengan alasan kandungannya menjejas ketenteraman awam. Selain tu, pejabat saya di Brickfeilds, Kuala Lumpur sering diserbu pihak berkuasa dan buku-buku saya selalu dirampas. 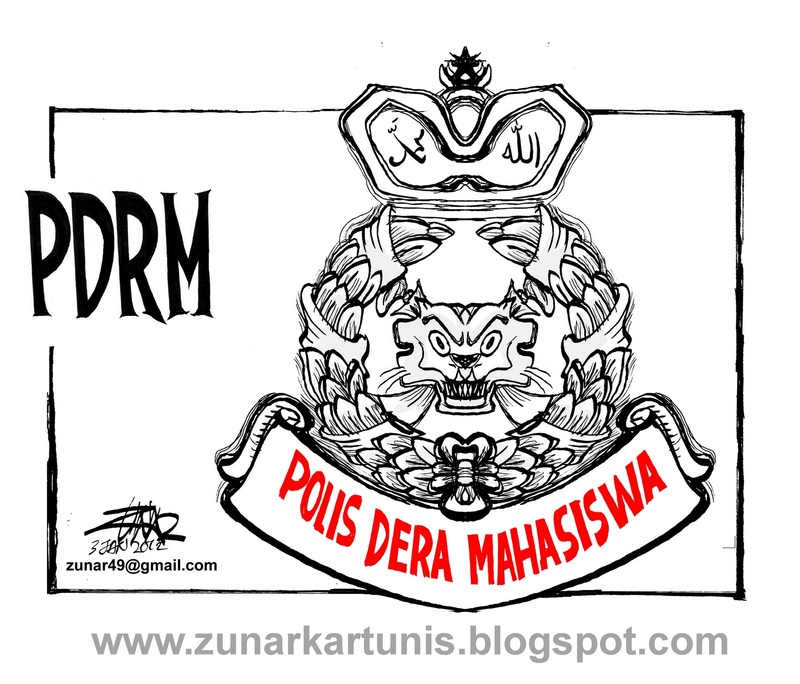 Editorial Cartooning"(Keberanian Dalam Melukis Kartun Editorial) kepada Zunar. (Terlebih dulu perlu dijelaskan, orang yang menceritakan peristiwa ini kepada saya minta dirahsiakan, tetapi saya berkata kenapa tidak didedah supaya rakyat tahu hipokrasi pemimpin Umno/BN. Sebagai jalan keluar saya berjanji untuk merahsiakan nama). Dalam majlis di Istana Negara menyambut Agong yang baru, Datuk Seri Anwar Ibrahim dijemput sebagai Ketua Pembangkang. Anwar hadir bersama isteri Datuk Seri Wan Azizah Ismail. Turut hadir dalam majlis tersebut ialah menteri-menteri kabinet, semua ketua-ketua tertinggi jabatan kerajaan, semua ketua-ketua tertinggi institusi pendakwaan serta para hakim. Sementara Agong belum tiba, seorang ketua jabatan pendakwaan mengaku kepada Anwar bahawa dia tidak terlibat dalam kes baru ini (merujuk pertuduhan liwat). Kata Anwar: "You jangan bohong, menurut Datuk ........, you yang beria-ia sangat nak dakwa saya. "Tidak Datuk Seri, masa kes sampai ke tangan saya, saya nampak ia memang longgar dan tak berasas, tapi saya terima arahan (pihak atasan)." Seorang menteri kanan kemudian datang menyapa, "Apa khabar adinda ku Anwar?". Kata Anwar, "Apa adinda, hari-hari U bantai I, ....." Dua lagi menteri kanan portfolio penting juga datang menyapa. Seorang Menteri Besar negeri Umno datang menyapa dan bertanya khabar, Anwar berkata di sini u buat baik, kenapa I pergi ceramah di ........, u padam lampu. Jawabnya, "bukan saya beri arahan, saya tak terlibat." Isteri Menteri Besar tersebut tegur Anwar, "Datuk Seri, U nampak berseri dan segak, tak seperti dalam TV, surat khabar, nampak sakit dan lemah. Azizah mencelah, "Memang la, surat khabar, TV Umno memang nak tunjukkan Anwar lemah." Seorang hakim kanan berkata kepada Anwar, "Saya sungguh jelak tengok perangai menteri-menteri tersebut, macam-macam mereka lakukan terhadap Datuk Seri, tapi hari ini semua nak tunjuk baik."